A quality preschool education is the best investment you can make in a child’s future. HERE AT TINY TREES WE ARE COMMITTED TO EQUITABLE ACCESS. If you look at our tuition price and think “I can’t afford that” then you most likely qualify for some form of financial assistance. Tiny Trees offers a diverse portfolio of financial aid, including partnership with the Seattle Preschool Pathway Program, Seattle Milk Fund, a sliding scale for financial aid, and additional scholarships. For the 2019-20 School Year, Tiny Trees is introducing a sliding-scale financial assistance structure to more broadly serve our families. 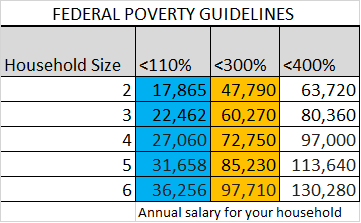 A starting point in our decision, though not the only consideration, are household incomes that are less than 400% of the national poverty line (see table below). Our funding source is a combination of Tiny Trees raised funds, grants, and partnerships with organizations and entities that believe in our program. Based on our financial projections, we aim to reduce tuition rates at an average of 10-30% for qualifying families. 100% FREE tuition for qualifying 3 and 4 year old students in 5-day programs at Beer Sheva Park, Camp Long, Carkeek Park, and Jefferson Park. 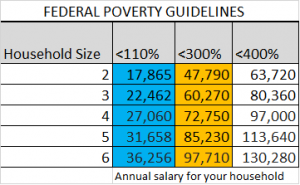 Families must meet income requirements and reside within the City of Seattle to qualify. More information about the entire SPP program can be found on the city’s website. Scholarships of $100-$200/mo per qualifying child. Available to students attending Five Mile Lake and Seahurst Park locations whose parent/caregiver is also pursuing a college degree. Can be combined with Tiny Trees financial assistance. Income restrictions apply. Families can also apply for their own scholarship directly from the Seattle Milk Fund. Applications for assistance are submitted at the time of enrollment. You’ll need to provide your household size, annual income, and supporting documentation. All possible resources listed above will be considered by the Tiny Trees team to find you the best financial assistance package. For regular enrollment, applications will be accepted through 3/15/2019 for bulk awarding for the upcoming year. Applications and enrollments completed after 3/15/2019 will be reviewed on a rolling basis. During enrollment, families applying for Tiny Trees financial assistance will only be financially responsible for paying the $50 non-refundable enrollment fee. Once an award has been offered and accepted, the $350 enrollment deposit will be invoiced to hold your student’s spot for the Fall. Families applying for the SPP-Pathway program will not have any fees or deposits due at the time of enrollment. For families of all incomes a payment plan is available through BridgeCare Finance. With BridgeCare you make convenient, affordable payments to BridgeCare and they pay Tiny Trees on time, in full each month.